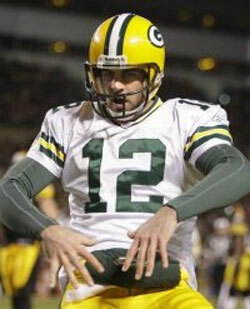 Rodgers Tops Pro-Bowl Votes - Fantasy Football, Fantasy Football Rankings | Mac Bros.
Green Bay Packers QB Aaron Rodgers received 1,581,982 fan votes to lead all NFL All-Stars in balloting for the 2012 Pro Bowl. Fan voting ended on Monday, Dec. 19. A record 100.64 million votes were cast by fans this year. The AFC and NFC All-Star squads are based on the consensus votes of fans, players and coaches. Each group’s vote counts one-third toward determining the 43-man rosters that represent the American Football Conference and National Football Conference in the Pro Bowl. NFL players and coaches will cast their votes on December 21-22. The teams will be announced at 7:00 pm (ET) Tuesday, December 27 on a special NFL Total Access 2012 Pro Bowl Selection Show on NFL Network. The 2012 Pro Bowl will be played on Sunday, January 29, 2012 and televised live on NBC at 7:00 pm (ET) from Aloha Stadium in Honolulu, Hawaii.